This time I would like to talk about passion. Why passion is so important in our life. I have read many books and articles about the passion. This article I summarize from some books and articles. Hopefully it might be useful to everyone. When I speak of passion, I don’t mean it in the romantic way. What I mean by passion is the powerful feeling of enthusiasm we all have inside of us. We are all enthusiastic and passionate about something, whether its finance, food or a favorite sport. That enthusiasm is very powerful. When we can combine it with our work, we are setting ourselves up well for achieving true success. When we are enthusiastic and proud of the work we do, the better equipped we’ll be to overcome the many obstacles that will surely arise in the process of starting a business or moving up in a career. Also, the more enthusiasm we have, the more inclined we are to work harder at improving ourselves. This will allow us to continuously get better at the work we do. The better we get at our work, the better we can get paid for doing it. In life we all have natural talents and skills that we use to make a living and build a life. However, one of the most skillful talents you have may be one you are not passionate about. 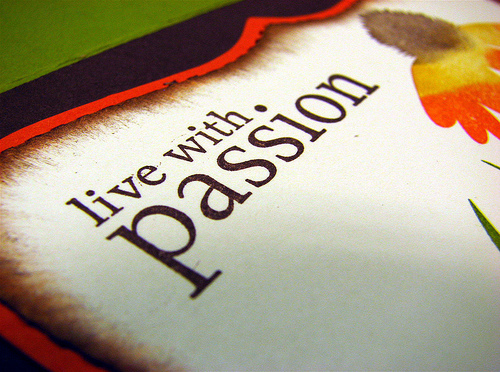 Here are 10 reasons why knowing and living your passion is important. 1. It Builds Confidence – when you’re passionate about something you’re confident in doing it and carrying out tasks associated with it. If you fail, you’re ready to get back up and go at it again. Passion gives a natural level of confidence to and about the thing it’s associated with. 2. You Never Stop Growing– passion encourage you to learn and gain knowledge in a specific thing. The desire to gather all the information you can about what your passionate about is inevitable. You never stop growing in your area of passion. 3. It Delivers Profit -someone once told me years ago, use your talents and knowledge as gifts to edify and profit. If you’re passionate about something it becomes a talent in which you harbor. Passions can be a way of life that produces income. 4. It Precedes Happiness – succeed or fail, when you make an attempt to go after , live in, or work with your passion happiness is always the end result. Even if you fail, your passion drives you to success. 5. You’re being Honest with yourself– if there is nothing else you know, or unsure of, it’s the one thing, or may be several things, you are passionate about. So the chase and thrill that comes with your journey is rewarding. Your motives are pure and honest. If you profit greatly from your passion, the feeling of satisfaction you receive is superior to the amount of profit. 7. Survival – perhaps one of the most important reasons on this list. Alexander Hamilton said “if you don’t stand for something, you will fall for anything”. Living your passion gives you something to live for. It can be a sense of security, because of that, you stand for what’s apart of you. Do you know and are living your passion? 8. Passion gives you the ability to focus. It gives you purpose and clarity. Passion allows you to narrow your sights on a particular target. 9. Passion also inspires. It is so strong that you are willing to suffer to see your passion become a reality. Passion comes from the Latin word “passio” which means “to suffer.” It is what you hunger for so intensely that you will sacrifice anything to have it. 10. Passion is influential. Passionate people attract attention. When you attract the attention of others, you become an inspiration to them and, therefore, an influence. – Kent Robinson, The element. Thank you, Karina. Passion is the difference between mediocrity and excellence. Great post. You are welcome 🙂 Thank you for your lovely comment. God Bless. The post about passion is on point. We need to instill this virtue in our children. Thank you very much for reading and commenting my post 🙂 it was a great honor to me. God Bless. PYour thoughts provide clarity. I believe you have helped countless people. Kudos! God is good and works through people. Thank you very much for you lovely words 🙂 God Bless. You are welcome 😉 Thank you very much for your insightful comment on my old post also thank you for reading..God Bless to you too.Have a great weekend in the Lord. Thanks for your like of my post on Israel; you are very kind. God Bless you too, sister Melody. Thank you and God Bless. thank you very much. Thank you for reading.